Formatt Blender Sunset Filters are for those who enjoy outdoor, scenic or architectural photography, Blenders are the perfect choice. Whether trying to affect color change or enhance a mood, Blenders give you the edge you need. The Blender Sunset Filter provides a multi-colored effect when shooting at dusk. 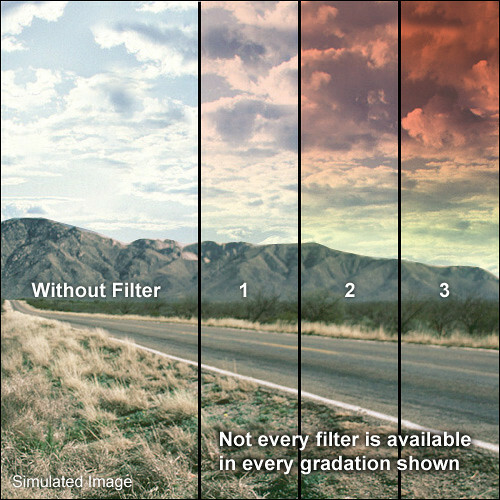 The sky appears red but as you work down the filter, the color shifts from orange to yellow with the bottom of the filter being clear. A much more dramatic effect can be achieved when using this filter. Note: Blender Filters resemble traditional graduated filters except that Blenders are colored on the top with a gradual transition over the entire length of the filter. Graduated filters transition somewhere in the middle of the filter.